With the new build of the SAP NetWeaver 2004s ABAP trial version (SP11), you may need to update your ABAP developer skills (beginners and experienced) to understand the new version. By the end of this tip series, you should have a good understanding of what's going on in the ABAP application server. In part 17, Dirk Feeken shows us how to create our first ABAP object. You have learned how to create database tables and ABAP dictionary types in part 14 and part 15 of our ABAP for Newbies series. Now is a good time to create your first ABAP class, which works with this data. Our first goal is an application which allows us to display and change the data of a selected customer. In this tip we will create the necessary ABAP object for this, and in the next one we will create the user interface with Web Dynpro. The intention is of course not to demonstrate a well thought-out, realistic example of object orientated modelling of a real business problem, which is a science in itself, and would go beyond the scope of this tip. Instead, we merely want to demonstrate how classes can be implemented in ABAP Objects in the form of a tiny example. The customer class will have a constructor, a set of public attributes and a save method which stores changed attributes to the database. 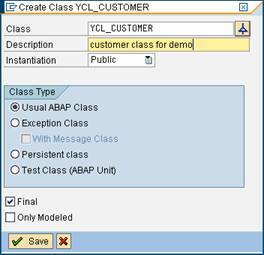 To create an ABAP class go to the ABAP workbench SE80, select "Class/Interface” and enter the name YCL_CUSTOMER in the input field and hit enter. Confirm the pop up and enter a description in the next window while leaving the other settings as they are. Of course we could also declare the attributes as private and offer setter and getter methods, which might be better style but let’s keep our example as simple as possible for the moment. Let’s assume an application that wants to instantiate a customer object knows in most cases already the ID of the customer (by a query method of a customer manager class for example). 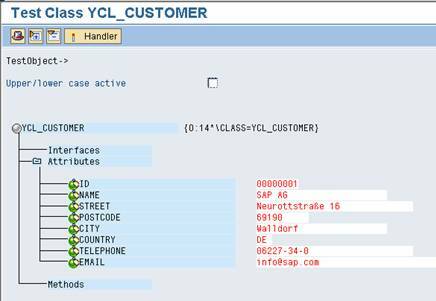 Therefore we create a constructor for the class with the customer ID as an optional parameter. 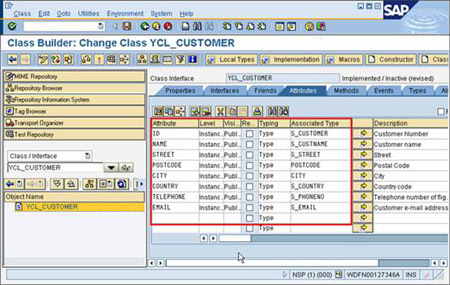 The constructor then gets the data of the customer and fills the object’s attributes with the values from the database. To create a constructor, click on the Constructor button on the upper right hand corner, and the editor for the already existing but empty constructor method opens. Click on "Parameters” to add the customer ID as optional (check checkbox in third column!) parameter of the dictionary type S_CUSTOMER. Clicking on "Methods” will bring you back to the former view and a double click on the CONSTRUCTOR method opens the ABAP editor. In the constructor we will first check if the customer ID has been provided or not, since it was declared as an optional parameter. If the ID is available we select the data of the customer with this ID from the database into a structure. The structure type is available in the ABAP dictionary because the database table SCUSTOM is based on it. Sometimes people are confused that a table in the database (table=many lines) is represented as structure (=single line) in the ABAP dictionary, but for the moment lets simply accept this as a fact. The structure is declared at the top of the method with the data: statement and filled with the Open SQL statement SELECT…FROM…INTO. The important point is that SQL is directly integrated into ABAP. You just type in the SQL statements into your ABAP code. The application server automatically gives you the connection to the database and hides completely the differences between the SQL dialects of different database which can drive programmers crazy. This is done via the "Open SQL” called layer in the application server, offering a unified SQL which is translated into the specific SQL dialect of the currently used database, making ABAP programming independent of the database vendors. Then the attributes of the object instance are filled with the result we got from the database. A column, the so-called component of a structure, can be directly accessed with the "-" separator, for example the name of the customer is available as S_CUSTOMER-NAME. SELECT SINGLE * FROM scustom INTO s_customer WHERE id = id. Type in the coding (and I recommend to type it rather than cut and paste), save and check the syntax of the method with the check button. If no errors occur you can activate the class with the button next to the check button. We see the first customer in our dataset is a company named SAP AG, located in Walldorf, Germany. Unfortunately the data is already outdated. Last year the city of Walldorf renamed the Neurottstrasse to Dietmar-Hopp-Allee in honour of the founder and former CEO of SAP. Although we can change the street name due to the public attributes we still need a method which allows us to save the changed data to the database. It is necessary to put the current attribute values into a structure first, because the SQL statements for updating or modifying database tables need the values in a structure matching the database table structure. The MODIFY keyword is the Open SQL statement for either updating an existing dataset or creating a new one. (We could have choosen here also the UPDATE statement, but we want to enhance the class later also with the capability to create and save new entries into the database, therefore we chose the MODIFY.) Enter the code into the method and activate the class. If you now click the Test button and instantiate the customer 00000001, the test environment will display also the new SAVE method. Now we can correct the address to Dietmar Hopp Allee 16 (2.). Check the Upper/lower case active checkbox (1. ), otherwise the data will be converted to uppercase and click on the clock/run icon (3.) right to the SAVE method. Now the data is updated and if you call the test again or look into the database table with the transaction SE16 it will display the new address. Although the integrated test capabilities of the ABAP workbench are quite useful for test purposes, we want to have a "real” application example in the end, of course. 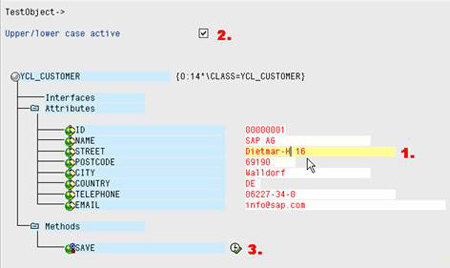 With our first ABAP class, we can start with creating a user interface in Web Dynpro, which allows to display, change and save customer addresses in the next tip. Want to read more from this author? Click here to read Dirk Feeken's Weblog. Click here to read more about ABAP on the SDN.